I`ll start putting the distance I travel each day under the heading from now on so you lot can check if I`m being soft or not without having to read the whole story. I left Narita about 11am and headed north, wasn`t really sure where too or why but I wanted to go for a ride and I`ve always liked going North! It was all very tame to start with, but after an hour of sitting in traffic in 40 degree heat with all the riding gear on (pictures to follow) it was back to lane splitting, clipping car mirrors and just a little bit of footpath action. I think half of the 280km was riding in between cars (its called lane splitting for you foriegners/car drivers) there is a serious amount of traffic in this country! I steered clear of the expressways due mainly to them costing money and I also wanted to take it easy and have a look around while riding. Finally found a place to stay at about 10pm, had heaps of trouble finding somewhere due to not being able read the signs and places being booked out. Happened to notice a place from the main road I was riding on and turned off down a narrow street to park out the front. Upon closer inspection I was unsure if it was somewhere to stay (I had previously that night pulled up out the front of a place whose sign I swore said guesthouse that was actually a Golf Shop!) so I asked a nearby local who was getting a beer out of his car. He understood English and being helpful as ever he took me in there and explained I wanted a place stay to the owners. It turned out to be a Ryoken, which is a traditional Japanese Inn. I had really wanted to stay at one of these so it all worked out good. 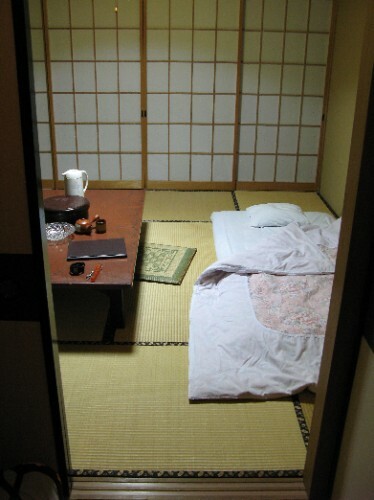 It is just one room with grass mats on the floor and a traditional low table that you kneel at. The owner came in and made up my futon shortly after I arrived, which is really just throwing a matress on the floor, I had a shower and was asleep in no time.